NASA’s Aqua satellite captured this image of Kate on Dec. 29 at 8:15 UTC and showed bands of thunderstorms were spiraling into the center of the storm, despite having weakened slightly from the previous day. 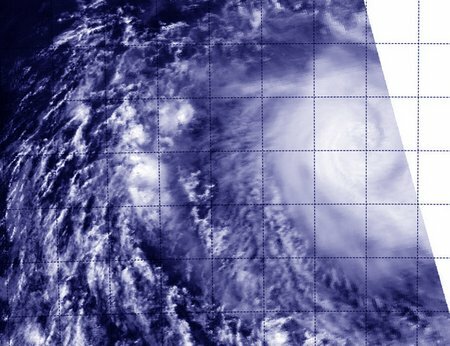 Tropical Cyclone Kate peaked in strength on Dec. 28, and NASA’s Aqua satellite passed over the storm on Dec. 29 as it began weakening over the open waters of the Southern Indian Ocean. On Dec. 28 at 2100 UTC (4 p.m. EST) Tropical Cyclone Kate had maximum sustained winds near 70 knots (80.5 mph/120.6 kph). It was centered near 14.6 south latitude and 92.1 east longitude, about 265 nautical miles (305 miles/491 km) west-southwest of Cocos Island. The Moderate Resolution Imaging Spectroradiometer or MODIS instrument aboard Aqua captured a visible picture of Kate as it passed overhead on Dec. 29 at 8:15 UTC (3:15 a.m. EST). The MODIS image showed that bands of thunderstorms were spiraling into the center of the storm, despite having weakened slightly from the previous day. On Dec. 29 at 9:00 UTC (4 a.m. EST) Tropical Cyclone Kate had maximum sustained winds near 65 knots (74.8 mph/120.4 kph) making Kate a minimal Category 1 hurricane on the Saffir-Simpson wind scale. It was centered near 14.9 south latitude and 91.7 east longitude, about 345 nautical miles (397 miles/638 km) west-southwest of Cocos Island. Kate continued moving away from Cocos Island- and in a southwesterly direction at 4 knots (4.6 mph/7.4 kph). Satellite imagery also showed that the strongest convection (rising air that forms thunderstorms) continued around the storm’s center and weak bands of thunderstorms are wrapping into the center. The Joint Typhoon Warning Center (JTWC) noted on Dec. 29 that it appeared that an eye feature was trying to form. The JTWC discussion noted that “upper-level analysis indicates a decreasing environment as moderate to strong (20 to 30 knots) easterly vertical wind shear is offset by good outflow that is beginning to decrease. A tropical cyclone needs good outflow (where winds spread out at the top of the hurricane) to maintain strength. Outflow means that air spreads out over the top of the storm assisting in its development. When outflow is weakened, the storm weakens. Kate is tracking slowly along the western part of a subtropical ridge of high pressure that is centered over Western Australia and will continue steering the storm in a southwestern direction. The Joint Typhoon Warning Center calls for gradual weakening over the next two days as Kate moves into cooler waters which will cause the system’s demise in a couple of days.